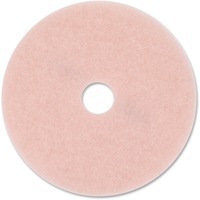 Eraser Burnish Pad 3600 is a floor maintenance burnishing pad made of high quality synthetic fibers in a nonwoven web construction. The fibers are bonded to the web structure with a durable resin system that permeates the entire pad. Unique design and durable construction make these pads the industry standard for consistent performance and long life. Pad is reversible and will not be significantly affected by water, detergents, or cleaners normally used for floor maintenance. It is designed for burnishing finish coated flooring such as sheet vinyl, vinyl tile, marble, terrazzo or concrete. Use on ultra high speed floor machines operating at 1500 to 3000 rpm.